The origins of this beer stretch back to Good Beer Week 2013. It was the first year the festival had a Hub, at which we worked with the staff to "theme" the taps so there would always be a mix of Aussie classics, a couple showcasing new Aussie breweries, a couple dedicated to monsters and a few for internationals who were visiting the festival. Two were also set aside for a Time Out magazine Melbourne vs Sydney face-off, where attendees could vote for their pick of the two beers across the week. Representing Sydney was the then very young Riverside Brewing, while flying the flag for Melbourne was Cavalier. The latter hooked up with coffee roasters Proud Mary to create a black IPA heavily dosed with coffee. Their collaboration – the Angsty Hopster – won the vote and proved to be a rather enjoyable clash of styles. Three years on and the duo has been back in action together. 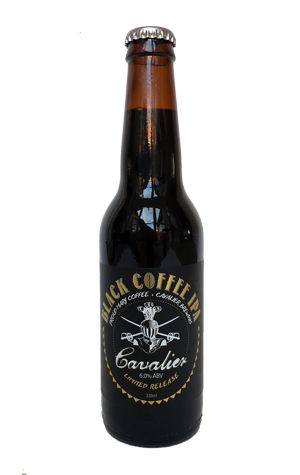 Black Coffee IPA Mk II is an opaque black beast with a foamy, crema coloured head and, at its heart, would appear to be a smooth, clean, fruity and event quite gentle IPA. We say "appear" as the beer was dosed with so much cold brewed coffee (from Red Bourbon beans if you're the sort of person to whom that means something) that it's as if the Proud Mary crew has wrapped the beer in a dark cloak: you're met by a sharp espresso hit up front and find the coffee is last to leave the party too. As bold as you'd expect a black coffee IPA to be.